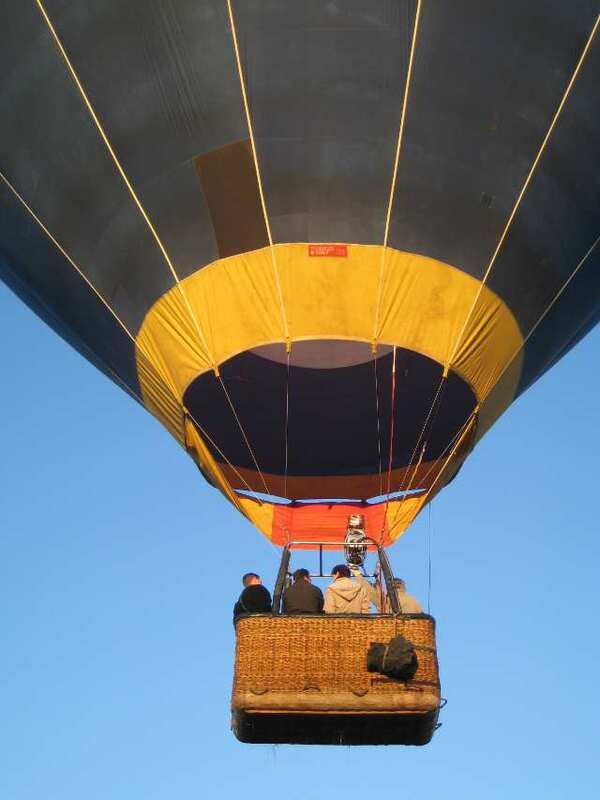 Hot air ballooning is possible from a number of locations in proximity to the Drakensberg, but especially in Winterton in the northern Berg (the cost is R2400 per person sharing, which includes the hot air balloon flight and breakfast after the flight). Hot air balloons are launched at dawn, as this is the only time the air is stable. You will drift with the wind, so there is no turbulence during flight - it’s just you and the elements. There are days where there is very little wind and other days where the wind picks up in flight, so you never know how far you will fly or where you are going to land until you get there. The flight duration is generally one hour, but can be anywhere from about 50 minutes to 1 hour 30 minutes, depending on the wind direction and the accessibility of a suitable landing site. The pilot uses the different directional winds at different altitudes to steer the balloon, however, the main control the pilot has is simply up and down. The pilot will usually try to vary the height he flies at; the maximum height he will attain will depend on Air Traffic Control authorities in the area, but it is usually about 1500’ to 2000’ above the ground. He may also fly at treetop height so you can see what is happening below you. The pilot heads towards an open field to land; the ground crew follow the balloon during flight and pack it up on the landing site whilst our passengers enjoy a celebratory glass of champagne. We then return to the Lodge for an amazing buffet breakfast. You will be returned to the starting point to collect your vehicle after breakfast. We recommend that you wear clothing in peelable layers, long pants and closed shoes as you will need to climb into and out of the hot air balloon’s basket. In summertime, your shoes can become quite wet in the early morning dew, so it is recommended that you bring a spare pair for after the flight. In winter, it can be quite cold, so please prepare for that by either wearing boots or two pairs of socks. The temperature in the air is about the same as on the ground, so no additional jackets are required. At any time of the year, we recommend wearing a cap and sunscreen on your face, as you are exposed to the sunlight during flight. Any extra jackets, handbags, backpacks or camera bags or tripods may be left with the ground crew during flight. You can also go ballooning in Gauteng at the Cradle of Humankind or the Hartbeespoort Dam (we are running a competition for a R500 hot air balloon voucher).